My two weeks at Casey Trees has been very well spent. On Thursday, we had our first professional development exercise to learn more about tree care. It was an experience I will never forget. 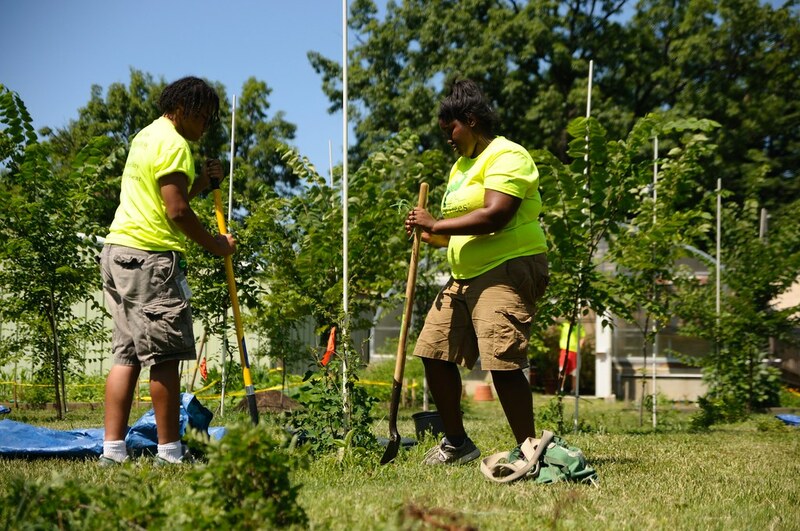 We earn professional development outings by meeting or surpassing our weekly tree care goals. Our trip to Daingerfield Island marked us beating our goal of 1,081 "tree touches" by almost 20 trees. 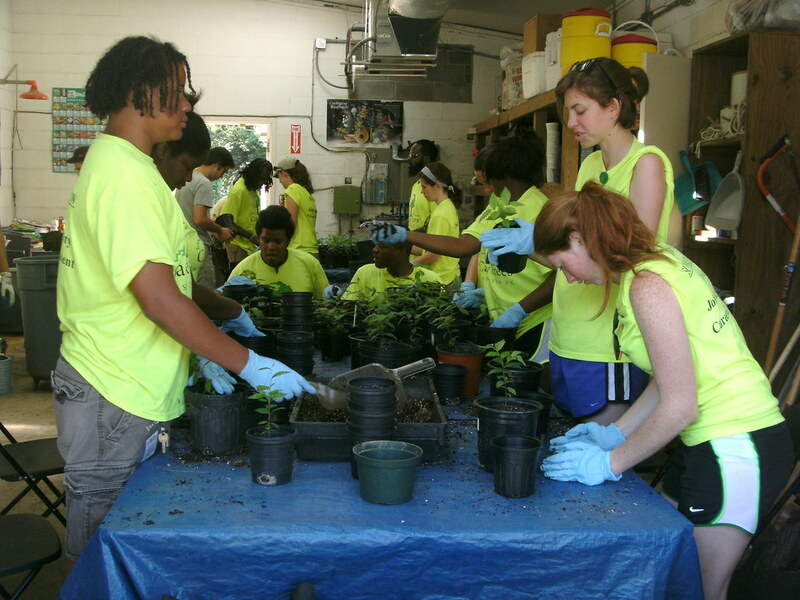 Fellow Summer Crew members selecting and re-potting one-year-old elms. 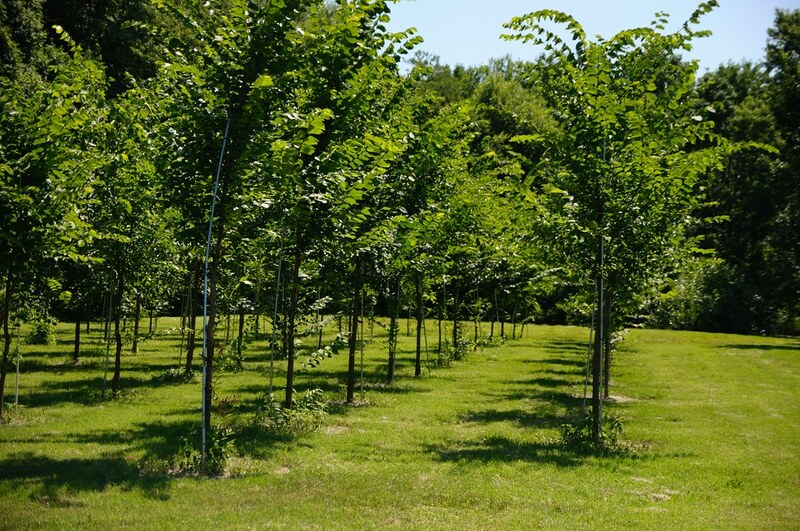 On Daingerfield Island, we worked with Barry Stahl who runs the American elm nursery for the National Park Service. We started off with re-potting one-year-old elms whose roots had outgrown their small pots. I re-potted nine baby elms and I got to save one from being thrown away with the other "runts of the litter." The tag on my baby elm read "Quesha Taylor's Saved Tree." After that we pruned a few of the two-year-old trees and added stakes to guide their growth. Afterward Barry took us outside to the nursery to transplant three-year-old elms. It was a little difficult at first but Jabbari and Mitchell helped me out. Together we transplanted three elms. This event helped the entire Summer Crew team forge a stronger bond since this Water By-Cycle and truck teams generally work separately. While we always have fun, getting to work and relax together was a huge bonus. Planting young American elms at the Daingerfield Island nursery. Following lunch Barry took us to an acre of land at the tip of the island filled with trees and giant weeds. Our job was to remove the weeds so people could see the river through the grove and make the area more safe for young students who visit to help plant the trees. When the area was clear, we planted trees. We all planted one tree that we could claim as our own. I picked a very special spot for my elm tree with just enough shade and sunlight. I cannot wait to go back in a few years to see how well the trees are doing. We ended the day back at Barry's garage eating watermelon. Even though we were all tired, we still managed to laugh and keep smiles on our faces. I can’t wait until we reach our next goal so I can learn more about trees spend more time with the entire Summer Crew team.